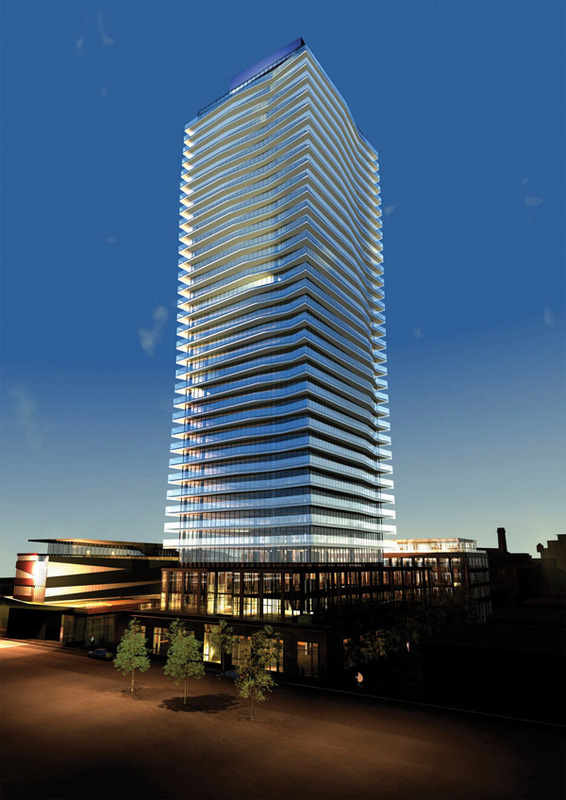 Developer: Gooderham 390 Cherry Street • Cityscape Developments Inc. This thirty-nine storey residential condominium structure with retail spaces at the ground floor is located at 390 Cherry Street, north of the railway lines. The four levels of subgrade parking are constructed within a continuous caisson shoring wall, at the south, east, and north sides, of the excavation. Walls are of reinforced concrete construction as are the columns, and are founded on strip footings and spread footings bearing on sound shale bedrock capable of safely sustaining a pressure of 4800 kilopascals, (ie. 100,224 pounds, or 50.11 tons per square foot). The three levels of subgrade parking slabs are all 230 mm thick reinforced concrete flat slabs with 120 mm deep drop panels over the columns and are cast of 35 megapascals Type AC1@ concrete. Within the area of the tower, the ground floor slabs are 200 mm thick with transfer beams up to 1500 mm in depth to carry loads from circular columns above onto the grid of the square columns in the parking garage below. From the fifth floor, through to the thirty-fifth floor, the floor slabs are 200 mm thick, with the interior spans being one-way reinforced concrete slabs spanning between the shear walls and with the corner slabs and balconies being 200 mm thick reinforced concrete flat plates. The floors’ concrete strength, at twenty-eight days, was specified to be 40 megapascals up to the fifth floor slab, reducing in 5 megapascal increments down to 25 megapascals above the fourteenth floor slab, to accommodate the varying strength of concrete in the columns. Most of the shear walls extend up to the lower roof and mechanical room floor, at the thirty-seventh level, where there is a 600 mm deep by 1400 mm wide ring beam, over the perimeter columns, to support the 300 mm to 400 mm lower green roof slab. The strength of concrete in the shear walls and columns, was specified at 28 days to be 55 megapascals up the eight floor, reducing in 5 megapascal increments down to 25 megapascals above the twenty-third floor. Lateral forces, resulting from wind and seismic effects, are resisted by the interaction of the shear walls with the central core, which contains a three elevator shaft, scissor stairs, a mechanical shaft and electrical closets.